Kick off your visit on the 25th (Tue): snap pictures at Bandra-Worli Sea Link, admire the striking features of Chhatrapati Shivaji Terminus, then take a memorable drive along Marine Drive, and finally take an in-depth tour of Chhatrapati Shivaji Maharaj Vastu Sangrahalaya. For more things to do, where to stay, traveler tips, and tourist information, you can read our Mumbai trip itinerary maker app . The Route module shows you all the different ways you can get to Mumbai. In June in Mumbai, expect temperatures between 38°C during the day and 30°C at night. Finish your sightseeing early on the 25th (Tue) so you can travel to Jaipur. Start off your visit on the 26th (Wed): look and learn at Jantar Mantar - Jaipur, then don't miss a visit to City Palace of Jaipur, and then look for all kinds of wild species at Amer Jeep Safari. Get ready for a full day of sightseeing on the next day: admire the striking features of Hawa Mahal - Palace of Wind, explore the historical opulence of Jal Mahal, then explore the historical opulence of Amber Palace, and finally admire the landmark architecture of Sheesh Mahal (Hall of Mirrors). To see more things to do, reviews, ratings, and tourist information, go to the Jaipur online holiday planner . You can fly from Mumbai to Jaipur in 4 hours. Other options are to do a combination of bus, taxi, and flight; or drive. When traveling from Mumbai in June, plan for a bit warmer days and about the same nights in Jaipur: temperatures range from 47°C by day to 32°C at night. Finish your sightseeing early on the 27th (Thu) to allow enough time to drive to Agra. Start off your visit on the 28th (Fri): explore the historical opulence of Agra Fort, then admire the striking features of Jahangir Mahal, and then admire the striking features of Taj Mahal. To see maps, traveler tips, where to stay, and tourist information, use the Agra online travel route planner . You can drive from Jaipur to Agra in 3.5 hours. Other options are to take a train; or take a bus. In June, daily temperatures in Agra can reach 46°C, while at night they dip to 32°C. Wrap up your sightseeing on the 28th (Fri) to allow time to drive to New Delhi. 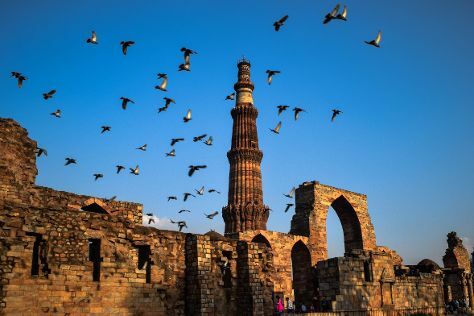 Start off your visit on the 29th (Sat): admire the striking features of Qutub Minar, then take in nature's colorful creations at Humayun's Tomb, and then don't miss a visit to India Gate. Get ready for a full day of sightseeing on the next day: step into the grandiose world of Red Fort (Lal Quila) and then admire the natural beauty at Akshardham. To find photos, where to stay, ratings, and other tourist information, refer to the New Delhi tour itinerary builder website . Traveling by car from Agra to New Delhi takes 3 hours. Alternatively, you can take a train; or take a bus. In June, daytime highs in New Delhi are 45°C, while nighttime lows are 32°C. Wrap up your sightseeing on the 30th (Sun) early enough to travel back home.